Ok here you go with the recipe. This is Betty Crocker’s recipe. Yummy Yummy in your Tummy..!!! Mix all the ingredients. The mixture is fairly a dry mixture though there is butter. Nothing to panic. Arrange the sliced apples in the tray and sprinkle the mix over the apples. The apples become very soft and the mixture turns into golden yellow color. And now the yummy part!!! 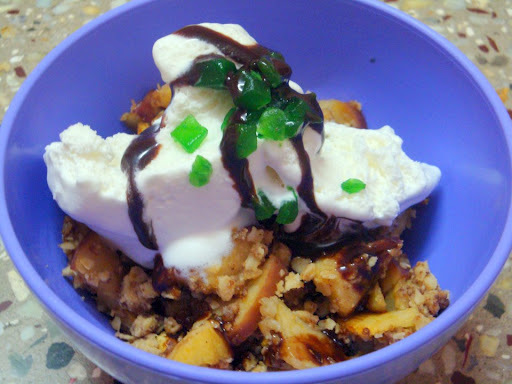 Serve the apple crisp with vanilla ice-cream…I just used cherry topping! Mmmm it was delicious.